Over the past several months, we have been working on the next generation of EasyApache. In EasyApache 4, we will make quite a few major changes to the way cPanel & WHM utilizes Apache HTTPd & PHP. This will initially be an opt-in update so that users can choose when to move to the new ecosystem, but at some point, this will be a required change. As you can tell, there are many changes compared to what EA3 has delivered over the years. The purpose of this article is to solicit feedback about what is being planned for EasyApache 4 delivery. We absolutely want to know what our customers think of this plan! See the link at the end of the blog post to provide us with your feedback. In order to adjust cPanel & WHM better to the operating system that the server runs, we will move the various Apache files & directories to match the file system paths that CentOS and RHEL use. This will allow better customizations to Apache and make the deployment of new Apache modules a rapid process. Symlinks will be left behind in /usr/local/apache to help old scripts work with the new paths. With these changes, porting most Apache modules that already have an RPM built for CentOS/RHEL should be relatively easy: tweak the spec file, ensure proper dependencies are provided, and recompile the RPM. Alternatively, it means that the existing resources for building RPMs for Apache modules will remain relevant and follow the process used by RHEL Administrators. With the initial release of EasyApache 4, we will move the EasyApache interface to the Package Manager, which will provide an interface for yum. 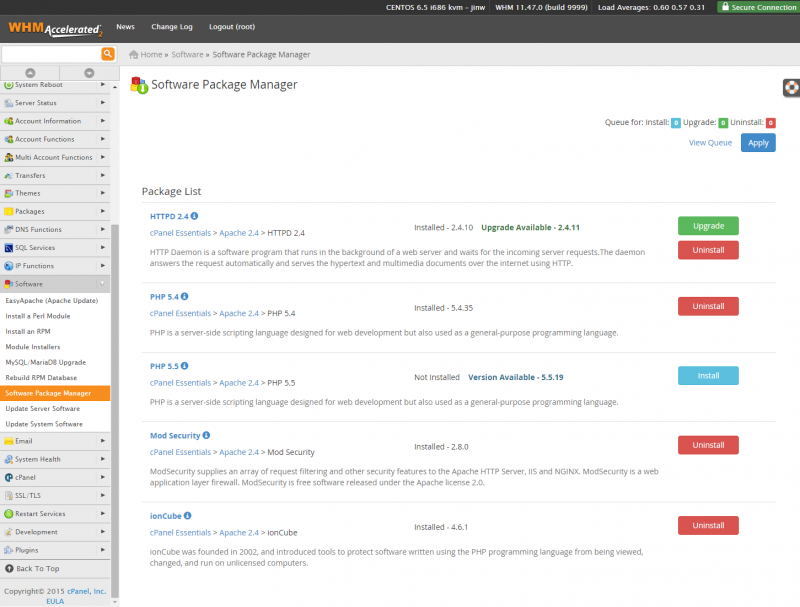 cPanel will create yum repositories that hold the EasyApache4 RPMs, which includes Apache, PHP, and friends. Using yum will also allow your own customized repositories. To shorten processing time and provide better quality control over the packages, EasyApache will begin utilizing RPMs. This will meet one of our project goals of cPanel & WHM becoming a better member of the Operating System’s ecosystem. The purpose of this UI is to provide a general-purpose interface into the packages and repositories available on a system. The release of EasyApache 4 will include Multi-PHP support at the VirtualHost level. We will utilize Red Hat’s Software Collections to allow the installation of multiple PHP versions simultaneously. WHM and cPanel Interfaces will allow users and administrators to select system level and per-domain default PHP versions. This will be achieved by using AddHandler entries in .htaccess files. EasyApache 4 will only provide RPMs for Apache 2.4. This allows us to provide better support for Apache and simplifies the process of rolling out customizations. We plan to automatically update Apache & PHP by default. This will be an opt-out process so that hosts can easily put updates of Apache & PHP under their control. We absolutely want to hear what you think of our plans for EasyApache4! Please visit the comment thread for this post on our forums.